This is a check-in and a little bit of plan telling for February. I am still working out of the January 1978 Workbasket, I have one more dessert recipe, I am wrapping up the beret and scarf, I am going to do a piece of wood art and I'm still tatting—which I am enjoying, but a little at odds with. Some practice, some completed…but mostly practice tatted pieces. I think tatting is awesome. It's beautiful and I'm kinda fast at it. I mean, I'm still learning and haven't perfected ANYTHING yet. But the process is a joy to figure out. I can't remember if I mentioned this or not, but shuttle tatting is NOT for me. 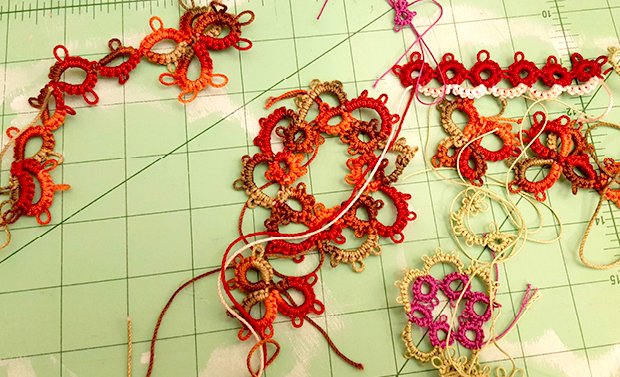 I'm a needle tatter and finding those patterns seem to be harder to find and I'm still trying to figure out how to read a tatting diagram. I've been: shall we say…a tad obsessed, with book reviews, book hauls, TBRs (To be Read) lists and book-a-thons on YouTube. Some of my favorites are: Merphy Napier, ReadWithCindy, Bookables, Bedtime Bookworm, and Francina Simone …just to name a few. Which leads me to my next obsession list…TBRs—mine specifically. You can see all my progress and reviews over on Goodreads. This is only part of my TBR…check out my other books at left. So, I've never really had a way of figuring what I'm going to read next. I just kind of go by how I'm feeling, which means I also just stop reading something (and just read something else for a while) based on how I feel. This isn't very productive. And since something I'm working on this year is being productive, I made this jar. I'll do a how-to on this soon. How I work it? 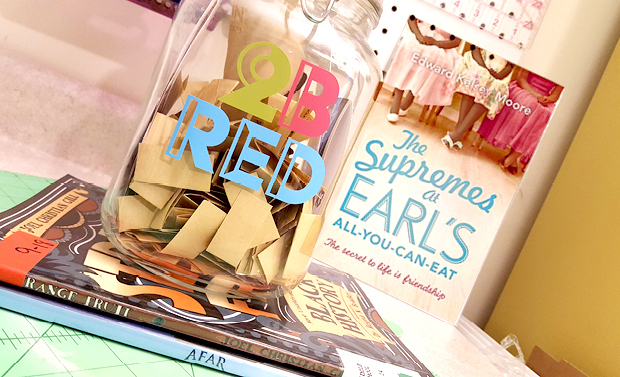 Inside the jar are little pieces of paper with book names on them. I finish a book, I pick a new piece of paper, it's not very scientific, but it's productive. However, this month I'm abandoning this process for February. Because February is Black History Month and I have chosen to participate in Black-athon. There are a bunch or challenges like read a book by a black author, read a book featuring a romance between a black character and another person of color, read a graphic novel featuring a person of color, read the group book, I'm sure I'm missing some, but I'm participating in the readathon—but since no one is grading me, I am doing it how I want. «««« My TBR is on the left.